A very long time ago, in this territory lived Illyrian people. They were ruled by Rome. In the seventh century AD, northern Slavic people came to live in the Balkan peninsula. Austria-Hungary made Croatia free from the Ottoman Empire and was ruled in today's Croatia until 1918. In 1918 it became a part of Yugoslavia which was taken over in World War II. After a small war with Italy a fascist dictatorship formed the Independent State of Croatia in 1941. It was not independent for long. Like all other countries in Central Europe the Nazi Germany had strong influence (see also Jasenovac concentration camp). Croatia is in Central and Southeast Europe. The Adriatic Sea is the southwest border. 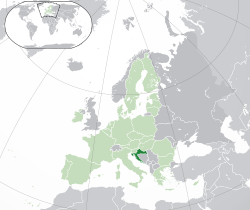 Croatia also has borders with Hungary, Serbia, Bosnia and Herzegovina, Montenegro, and Slovenia. Croatia is the 127th largest country in the world. The highest point is the Dinara peak at 1,831 metres (6,007 feet). Thousands of islands are part of Croatia. 48 have people living there year round. The largest islands are Cres and Krk. Major rivers are the Sava, Drava, Kupa and Danube. There are many deep caves in Croatia. 49 of which are deeper than 250 m (820.21 ft). Croatia's most famous lakes are the Plitvice lakes. Most of Croatia has a moderately warm and rainy continental climate. Average temperature ranges between −3 °C (27 °F) (in January) and 18 °C (64 °F) (in July). The coldest parts of the country are Lika and Gorski Kotar. The warmest are at the Adriatic coast. There are several ecoregions in Croatia. The coastline, forests, mountains, and rivers give Croatia diverse flora and fauna. There are more than a thousand endemic species. Croatia is home to the only known aquatic cave vertebrate—the olm. There are 444 protected areas of Croatia. Those include eight national parks, two strict reserves, and ten nature parks. The oldest national park in Croatia is the Plitvice Lakes National Park, a UNESCO World Heritage Site. Croatia adopted its constitution in 1990. It declared independence from Yugoslavia on 8 October 1991. The President of the Republic is the head of state. The President is directly elected to a five-year term. The Constitution limits the President to a maximum of two terms. Kolinda Grabar-Kitarović became president on 15 February 2015. The Prime Minister of Croatia is the head of government. Since 22 January 2016, the prime minister of the government is Tihomir Orešković. ↑ 1.0 1.1 "Grabar-Kitarovic elected Croatia's first woman president". 12 January 2015. Retrieved 10 December 2016. ↑ (in Croatian and English) (PDF) Census of Population, Households and Dwellings 2011, First Results by Settlements. Zagreb: Croatian Bureau of Statistics. June 2011. p. 13. ISSN 1332-0297. http://www.dzs.hr/Hrv_Eng/publication/2011/SI-1441.pdf. Retrieved 30 June 2011. ↑ "Human Development Report 2011" (PDF). United Nations. 2011. Retrieved 27 November 2011. ↑ 6.0 6.1 "World Factbook". Central Intelligence Agency. Retrieved 9 December 2016. ↑ "EVOLUTION IN EUROPE; Conservatives Win in Croatia". The New York Times. 9 May 1990. Retrieved 9 December 2016. ↑ "Croatiantimes – Deine Aktien und Trading Zeitung".